You've read the book, enjoyed the graphic novel and loved the movie. But can you really call yourself a true Coraline fan without going to see the musical... especially considering the 56-year-old child star? There were people who grumbled about how faithful or otherwise the film was... Now, I can point to the stage play and say, this is completely faithful to the book. On the other hand, you have to come to terms with a world in which Coraline is played by a 50-year-old lady. It's not that she's parodying a child, but that in a way she's not playing it as a child. She's just sort of playing a character who happens to be 9. Prepared piano was done by John Cage in the '40s and '50s... It consists of putting erasers and screws and playing cards in between the strings of the piano, and it converts the piano into an 88-key percussion orchestra. No two notes sound alike. 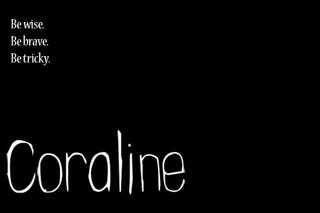 Currently in previews, Coraline officially opens at the Lucille Lortel Theatre in New York on June 1st.